There’s been a fair share of talking dirty here on The 104 Homestead. I’ve talked about dirty cookware and ways to clean and avoid it. I’ve mentioned some of my favorite DIY cleaning recipes and even aired my dirty laundry solutions here (sorry, the pun couldn’t go missed). Today I’m talking the worst-of-the-worst when it comes to cleaning. The baked on goop in your oven and the greasy residue that is stuck to your stove top. I’ve got solutions for you that don’t involve harsh chemical and a putty knife. Think Self-Cleaning is a Solution? Think again! 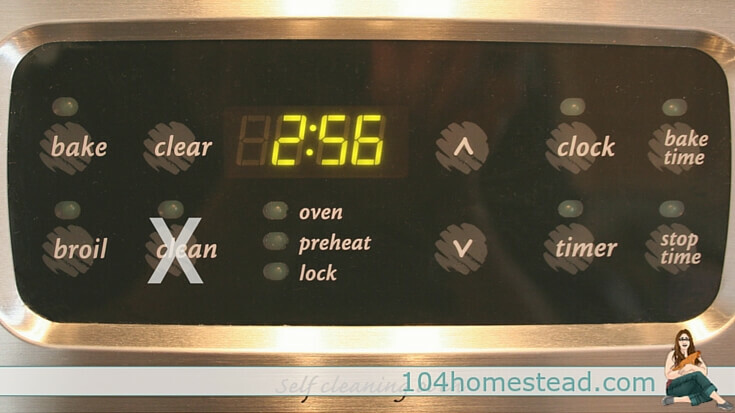 Self-cleaning ovens are coated with Teflon. When heated to close to 900º (the average temperature in a locked self-cleaning oven), Teflon releases toxic gases into the air. A scientific advisory panel to the EPA (Environmental Protection Agency) recently unanimously recommended that PFOA (a key component of Teflon) should be considered a likely human carcinogen.This classification means that there is evidence of cancer causing effects from both human and animal studies. Have I told the parakeet story yet? Let me head down a different path for a moment in this talk about Teflon. When I went to college I wanted to get a pet for my first apartment. I thought a parakeet was a good choice, so I got all the supplies and picked out a beautiful blue bird. I got him home and set him up in the wall divider between the kitchen and living room where I could see him from every angle. Perfect. A week later he dropped dead. I went back to the pet store and told them what happened. They said to be very careful of drafts and they gave me another bird. This time a pretty green one. I found a quiet corner in the kitchen away from the overhead A/C vent. Another week and this one dropped dead too. I was really feeling bad for these birds. After killing a third bird and heading back to the store for a goldfish, an employee who knew my plight asked me if I cook with Teflon. I said yes and she went on to explain how it is incredibly toxic to birds. She said numerous people brought back birds who had died of Teflon fume exposure. Poor Tweety(s), I had gassed them at nearly every meal. A simple baking soda and vinegar mix will do the trick, but I’ll be honest: it takes patience and elbow grease. It does not, however, create harmful fumes and you don’t have to worry about caustic materials on your skin. Please remember to unplug your electric stove when cleaning it. Sprinkle a thick layer of baking soda along the bottom of your oven. Pour on enough white vinegar to get the baking soda bubbling, but not flood your oven. Close the door and wait for about 4 hours. Use rags to wipe the majority of the loosened grease and debris out of the oven. Follow up with a sponge and all-purpose cleaner to get the sides and any stuck-on residue. Say no to the self-cleaning option. This recipe contains borax which I know is grey-area for some. Please keep a few things in mind when it comes to borax. First, it is certainly safer than the majority of commercial options. Second, do not confuse it with boric acid which is highly dangerous. They are not the same thing. Third, although there are claims floating around questioning the safety of using borax, there is no proof that borax is harmful when used properly. Combine 2 tbsp. Dawn Detergent, 2 tsp. Borax and 1 qt. hot water in a spray bottle. Saturate the stovetop (again, unplugging if your stove is electric). Let it sit for 15-30 minutes. Wipe away with a clean rag. Often the results will be a shiny finish, but if you want more shine try using my DIY glass cleaner recipe. 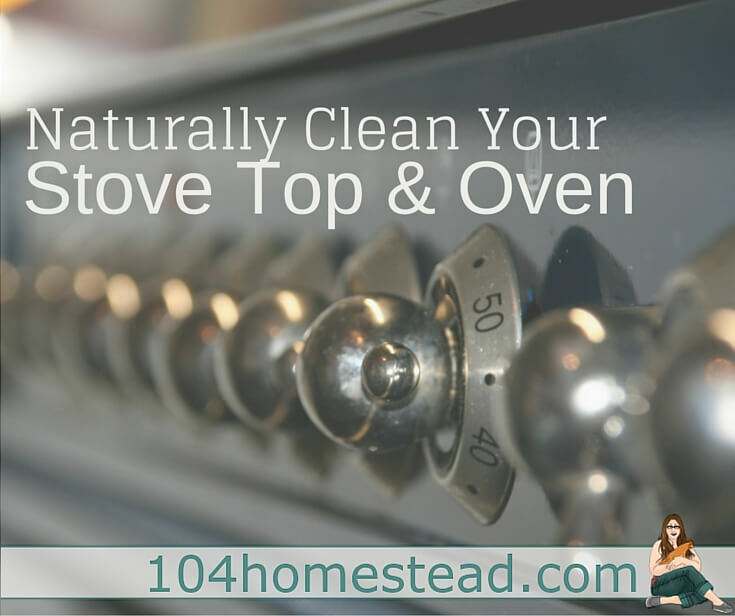 Now sit back and enjoy your sparkly clean stove (and healthy parakeet). Is the dawn brand detergent essential? I live in Australia and I’ve never seen dawn brand.